Josephus Laurentius Dyckmans (1811-1888) was born in Lier and settled in Antwerp, Belgium in 1833, where he was a pupil of Gustave Wappers (1803-1874). He taught at the Academy of Antwerp where one of his pupils was the German painter Wilhelm Busch (1832-1908) who however did not follow his obsessive concern for precision. Dyckmans worked for some time in London, where he exhibited at the Royal Academy in 1846, 1860, 1863 and 1869. This painting is a typical example of Dyckmans' genre paintings that he executed during his several stays in London. It shows a classic high Victorian interior design with elegant furniture, chemically dyed carpet and sober wallpaper. It presents on the occasion of the grand-mother's birthday three generations of women. 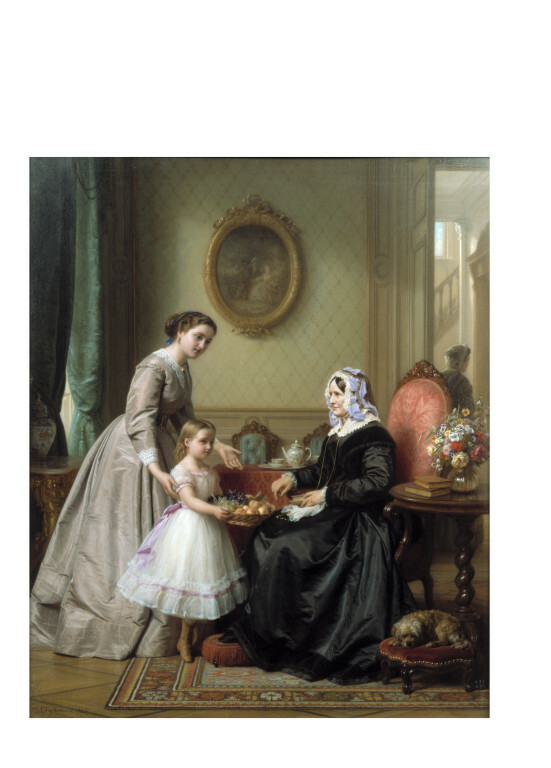 The grandmother is dressed in black and may therefore be a widow while the mother and the daughter display refined laced and satin dress in typical Victorian fashion. A small dog is resting on a footstall besides the grandmother, thus balancing the compositional scheme of the whole picture. 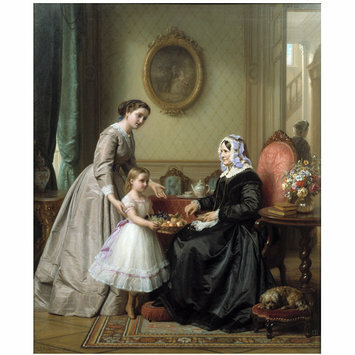 A mother and child both standing at the left, present a basket of fruit to the grandmother, seated, dressed in black, at the right in a high Victorian interior. A small dog on a footstool at the right. Bequeathed by Frederick Heusch, 1871. The 'Grandmother' portrayed in this picture was Mrs. Sarah Heusch, the donor's mother, and the work was painted in London, where the artist was a frequent visitor. Historical significance: Josephus Laurentius Dyckmans was a Belgium painter renowned for his painstaking technique and his highly refined genre scenes. He specialised in genre painting, showing the daily activities of the rich middle class, a trend that he would develop in London where he painted the present picture under the influence of the Victorian imagery. 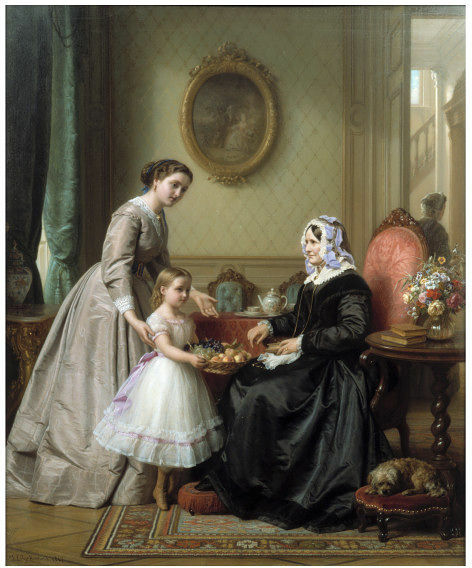 The present painting is a good example of Dyckmans' production of Victorian pictures as it shows a highly detailed Victorian interior with its inhabitants: three generations of woman, the grandmother, the daughter-in-law and the grandchild, whose gathering relates to a collective portrait. The grandmother, Mrs Sarah Heusch, had passed away some years before the execution of the painting (in 1864 whereas the painting was made in 1867), which therefore renews the antique tradition of portraits originally invented for memorial purposes. Hence it may be that her features and pose were painted from a photograph, a technique that was particularly well developed in that period, whereas the mother and child were painted from life. This painting was commissioned to the painter as the grandmother was the donor's mother. Comparable works are The Bride, dated 1858, Christie's Amsterdam, 18 Nov. 2008, lot 257 and The Canary's Song, dated 1866, Sotheby's New York, 28 Jan. 2006, lot 263, where the same compositional ideas and pictorial technique, that is a smooth finish and minute recording of fine detail, are displayed. Dyckmans inherited his obsessive concern for precision from his master, Gustave Wappers (1803-1874), whose teaching he followed at the Antwerp Academy and later his impressive technique earned him the appellation of 'Belgian Gerrit Dou'. Dyckmans had quite a prolific output and a certain number of his works are now housed in the Museum voor Schone Kunsten in Antwerp. The artistic relationship between the Northern and the Southern Netherlands, that is modern-day Holland and Belgium, were very strong during the 19th century especially after the proclamation of the Kingdom of Netherlands in 1815. The Prix de Rome was awarded equally to Antwerp and Amsterdam artists, even after the independence of Belgium in 1830. The majority of Belgian art of the first half of the 19th century, including history painting, genre scenes, landscape and portrait paintings, articulated a new national pride which nevertheless drew upon French academic taste. Such artists as Jean-Bernard Duvivier (1762-1837), Henry Leys (1815-1869) and Karel Verlat (1824-1890) made extensive use of these renewed genres in their oeuvre. Focusing on the achievement of a greater realism, Belgian artists travelled a great deal, not only for training purposes in the tradition of their artistic predecessors but for the sake of discovering new surroundings and making new acquaintances: Paris was the favourite destination. While Italy also remained a popular destination, the majority of these artists tended to move on to other areas of interest, such as Morocco, less for their artistic traditions, and more for their exotic aspects. Kauffmann, C.M., Catalogue of Foreign Paintings, II. 1800-1900, London: Victoria and Albert Museum, 1973, p. 35, cat. no. 76. 100 Great Paintings in The Victoria & Albert Museum, London: V&A, 1985, p.164. L'art belge 1830-1880, exh. cat. Brussels, 1880, no. 318. U. Thieme and F. Becker, Allgemeines Lexikon der Bildenden Künstler, x, 1914, p. 273. Dyckmans was Flemish but spent time in London. His detailed and highly idealised scenes of everyday life were very popular. This painting includes portraits of the wife, daughter and mother of the man who commissioned it. Mrs Sarah Heusch, the 'grandmother' of the title, was dead by this date, so her likeness was probably taken from a photograph.